It is no secret that the price at which retailers can ultimately sell beef and other meats has an enormous impact on the price of cattle. Beef demand is contingent upon quantity sold and the price at which it was sold. The prices of other proteins, namely pork and chicken, have an indirect impact. If pork price gets cheaper compared to beef, then some consumers might buy pork instead of beef which impacts beef demand. Beef prices have been mostly lower in 2017 and 2018 than they were during the lower-supply years of 2014-2016. But, they have not fallen off significantly and the larger supplies of 2018 are still moving at relatively strong beef prices. 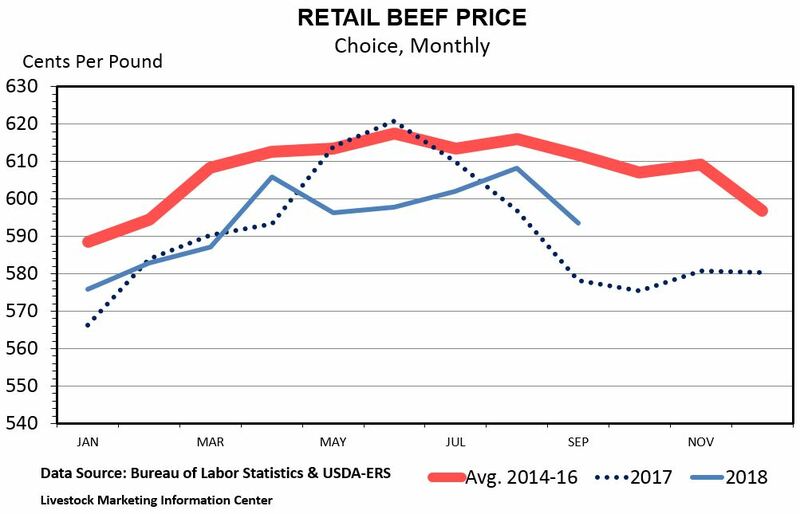 There are indications that retail beef price fell in September according to Bureau of Labor Statistics survey data that is compiled by USDA’s Economic Research Service (ERS) and the below commentary from the Livestock Marketing Information Center. The biggest retail price decline from August to September was for Choice Beef, falling 15 cents per pound. Even with the drop in price, compared to twelve months earlier, prices were still 2% higher. ERS also calculated a monthly “All Fresh” retail beef price which declined 4 cents per pound in September but was slightly higher (up by less than 1%) compared to a year earlier. Ground beef prices in September were moving lower, similar to the ERS measure of “All Fresh” beef. The exception was the lean or extra lean grades that were up 2 cents per pound. The declining price trend for fresh beef during September has been the general rule since 2011, with declines of 2-5 cents every year except in 2014. In 2014, cow slaughter was down close to 20% from the prior year, and beef production declined by nearly 5%, resulting in tight supplies of beef grinding material. During the last three years, the “All Fresh” beef price in grocery stores has continued to decline during the last quarter of the year. Wholesale price trends for beef trimmings in recent months were moving lower relative to the first half of the year, which should keep retail ground beef prices on the defensive. That compares with retail pork prices that were 5% lower than a year earlier and chicken prices that were lower by a fraction of a percent. Lower pork price was driven by bacon. Nationally, September bacon prices averaged $5.50 per pound. In September 2017, grocery store bacon prices set a record at $6.36 per pound. Grocery store chicken prices fell 2 cents per pound from August, reaching the lowest level since January. On a quarterly basis, that average price fell below $1.90 in the last quarter of 2016 and has not returned to that level since. Next PostNext So What Does an Average American Want in a Farm Bill?